Fear is actually an amazing friend. 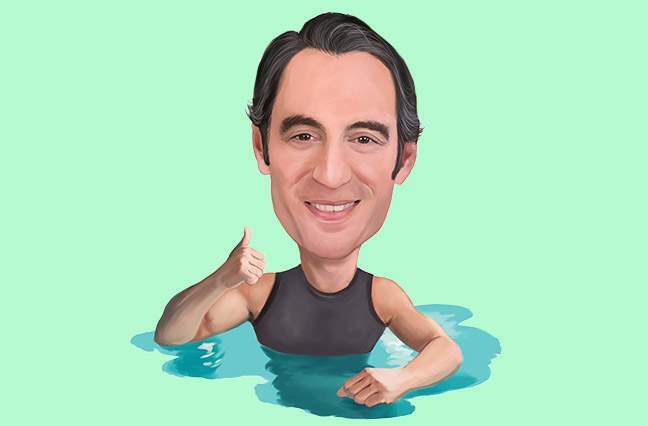 How does a busy insurance executive become a competitive open-water swimmer? If I’m not active, it’s sad for everyone within 100 yards of me. I’m limited in what I can do competitively due to a lot of injuries, so I just got into pool swimming. Then my physical therapist, who I see almost as much as I see my family, suggested competitive open-water swimming. I go out at 5:30 in the morning three to four days a week to a high school pool in my neighborhood. On off mornings, I do resistance training and aerobic work. I try to take Sundays off. If I had one night in San Francisco, where should I eat dinner? I love Kokkari, a Greek restaurant downtown. Everything is great. This is going to sound snotty, but they have great grilled octopus. And they have amazing lamb and sole. What’s kept you in the insurance business for so long? The appeal for me is the delight and the challenge of building and helping people in their careers and, more broadly, in their lives. That really has become my life’s work. And there are so many opportunities to do that in this industry. It is one of the most misunderstood aspects about our business. Helping people in their lives specifically within the insurance industry? There are so many opportunities and career paths in our industry, and, as a result, we have more opportunities to develop, sponsor and build team members than ever before. I think this requires a more fluid view of leadership, where we shift from the bifurcated lens of 30 years ago, where you lead and develop people in their work lives and their personal lives are this separate, private thing. Our younger colleagues have helped show us that is not the case. They want a different level of sponsorship and support for their development and ability to make an impact and be relevant. We’re talking about making a real commitment to the people we work with—who are going to have our jobs tomorrow and who will inherit this company. That’s not work-work, that’s life work. So you put a big emphasis on company culture? After people, culture is the most important asset we have at the firm. It’s the filter through which we attract and retain great people, the filter through which we choose not to pursue certain people or some of the acquisitions we consider. Simply put, it’s the behavior and value set that we’ve developed over 100 years that define who we are, who we aspire to be, the kind of people we want, the kind of clients we want and, at the end of the day, the way we behave when no one’s looking. Mine are always kind of the same. I want to constantly improve in every aspect of my life. That translates to continuing to learn at a faster, more aggressive pace in just about everything. Another resolution is to wrestle a little more successfully with the depth of my love for all things dessert. I don’t recall. I think Christina Harbridge. She is the founder and “mischief” executive officer of a firm called Allegory. Why is that the best piece of advice? I think at our core we are wired and taught to avoid fear, concern, doubt, uncertainty. And that avoidance keeps us from learning. These challenges actually teach us the very things we need to know to get better—at everything. Fear is actually an amazing friend. But we’re all built to think of it as a dental visit with no novocaine. You gotta dance with it. The way we design, build and articulate meaningful and relevant career paths and opportunities for our young and our as-yet unhired professionals. It’s an industry that has infinite possibilities. A combination of a few things: an absolute commitment to being a learner and not a knower, a desire to be wrong in order to get better, and a clarity of vision for our people and our firm. Favorite vacation spot: Anywhere I can be with my wife and kids. Favorite San Francisco movie theater: Kabuki [1881 Post Street]. They have the comfy first-class airline seats and real food. It’s a pricey movie, but the food’s good and the seats are great. Favorite Scorsese film: It’s a tie—Mean Streets and The Departed. Wheels: BMW 540. It’s a Clark Kent car—low-key on the outside, vroom vroom on the inside.